Misty cooked up something last night that would make any kid run crying from the table. It featured two commonly-hated vegetables, goat cheese, and an African grain most people can't pronounce. Since there was no recipe, the dish doesn't have a name. 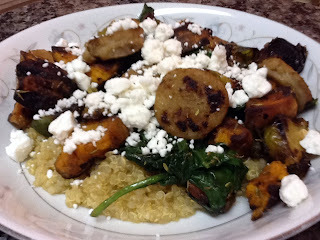 It was a scramble of chicken & apple sausage, spinach, roasted sweet potatoes and Brussels sprouts over a bed of quinoa and topped with goat cheese. Of course it was delightful. And of course our kids wouldn't touch it.